USS New Mexico (SSN 779) - Really, What Were We Thinking? Tweet The PCU (pre-commissioning unit) New Mexico is officially the USS New Mexico. She belongs to the Navy! The ceremony was held today in Norfolk, VA. Chris is the official first Officer of the Deck and has a small role in the ceremony, ensuring his place in naval history! It was very touching. If you'd like to watch the full ceremony (approximately 45 minutes), it is available here. Last night, the Commissioning Gala was held at the Waterside Marriot in Norfolk, VA. Many New Mexico related gifts were given to the boat and there were various speakers. Since I'm still just hanging around being pregnant, I decided to go with Chris. Luckily I had ONE dress that actually fit & would work for semi-formal attire. 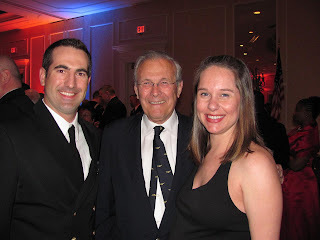 Other than free food, the highlight of the evening was having Donald Rumsfeld tell my husband that he married way out of his league. That was music to the ears of this 10 months pregnant lady!